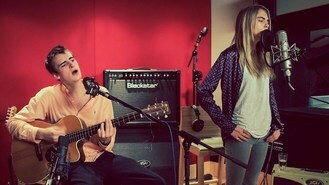 The pair performed an acoustic version of Klangkarussell's No 3 hit, Sonnentanz (The Sun Don't Shine), which Will features in, after the model joined him at the studio. "What she does is quite honest. If I was to make music with her, it would be more soulful. She's got a really nice voice, and I think, 'Why not?' If she's got time, she should write an album," said the 21-year-old. Will - who next features in The Aston Shuffle's track Comfortable - admitted he was surprised when Cara dropped into the London studio. "I've known Cara since we were both 14 or 15, through mutual friends. But I haven't seen her for ages, because she was working so much. When she turned up from a plane somewhere, we free-styled it a few times," he recalled. "It was so spontaneous - it's cool. It was amazing. We jam anyway when we're bored and we're at a party or something - we start beat-boxing and singing. She's got a guitar in her bedroom, which I always play." Sonnentanz (The Sun Don't Shine) got extra hits after Cara recommended the song to Rihanna. "She played it to Rihanna, who said I reminded her of a young Bob Marley. I can't believe it," Will said. "I have to give her a big hug and say thank you when I meet her. I'd love to make music with her, but I need to practise on getting good first."